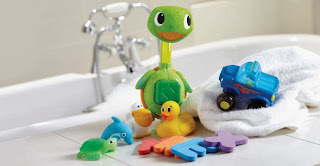 Today's amazing prize is a wonderful bath time bundle from the lovely people over at Munchkin - manufacturer of clever products designed to make parents’ lives easier and more exciting. Munchkin know it’s the little things that make the biggest difference which is why their products have made such an impact on parents and resulted in many industry awards. Founded in 1991, Munchkin's big idea was to rid the world of tired and mundane products by developing clever, innovative solutions that excite and delight families - making parenting safer, easier and more fun. We've been a fan since Little E was born so we are so excited to offer such a lovely prize!